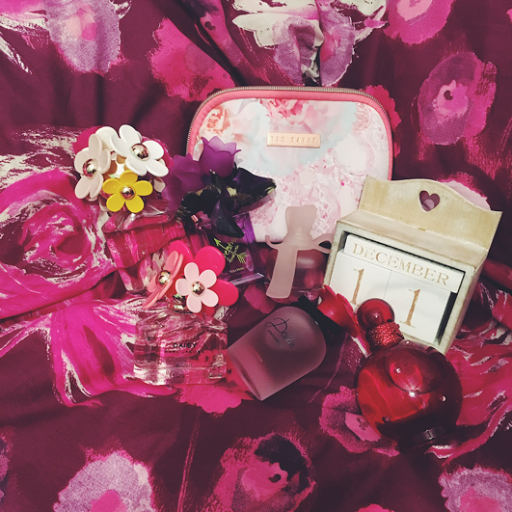 Over the past couple of months, my Perfume Collection has expanded a lot; I've become a bit more careful about where I buy from and the price that I pay for perfume, as if you look around enough you can find online good prices that you won't find in stores. There are several discount websites that offer good brands for good prices, and eBay is another good choice if you don't mind paying for slightly used items. I bought Mademoiselle Ricci L'eau by Nina Ricci for the bargain price of £14.95 for 30ml; because I looked around and researched different sites and prices, similarly with Hidden Fantasy by Britney Spears. I paid £12.50 for the 100ml which was a fantastic price for the size of the perfume. Very fruity, floral and fresh, with notes of stargazer lily, orange, tangerine, grapefruit blossom, jasmine and amber, it lasts for a few hours but smells amazing and feels nice on the skin, too. Like the other Fantasy fragrances, it comes in a round bottle, in the colourtones of red with pink crystals scattered around and looks lovely as a part of the Fantasy set. I now own 5 different Fantasy perfumes and love all of them. I was so excited to finally get my grubby little paws on Daisy Blush by Marc Jacobs after seeing so many bloggers review the limited edition Blush series of perfumes. I bought the 50ml bottle for £45, which was very pricey but the smell is lovely. With notes of pear, water lily, honeysuckle, lily of the valley, mimosa and bergamot the fragrance is very floral with a hint of musk. The bottle itself is very cute, with the fragrance as a pretty pink shade inside the clear bottle and topped off with 3 daisies in different shades of pink with gold centres sitting as a lid over the spritzer. As this is a limited edition fragrance I felt like I couldn't wait any longer as they don't get sold forever. Which is good, as it gave me the push to purchase, but also dangerous as it meant it was a bit of a spur of the moment purchase... Oops. I don't regret it, as it's a lovely smell and looks nice with the recast of my collection. Another Marc Jacobs fragrance that I decided to buy was Daisy Eau So Fresh, which for £44 and 75ml was a good price as the bottle is much bigger than Daisy Blush. I actually wore this perfume for my graduation from university as I love the smell so much, although I have to say I had to keep reapplying it as it didn't seem to last well, which was a shame. That said, the smell is absolutely divine with notes of raspberry, plum, violet, apple, grapefruit, jasmine, rose and tree blossom. I felt really adult and sophisticated when I was wearing it at graduation, and I felt like I needed it in my life again, but this time in the bottle form and not as a sample. The bottle itself is very pretty, with a clear bottle and pale pink fragrance coming through; there's a burst of flowers that make up the lid in white, pale pink and yellow with gold centres that cap off the spritzer. The Daisy fragrances have a very distinctive feature through the floral lids and as such, they look absolutely lovely when on display. I bought another perfume by Vera Wang, although I didn't buy from her Princess range; I purchased Lovestruck Floral Rush for the excellent price of £19 but the bottle is tiny, even for 30ml which was a bit of a disappointment. It has an interesting smell and I'm not sure if I like it yet; I definitely don't love it and I don't see it becoming a favourite fragrance of mine any time soon. It has notes of champagne, apricot blossom, pink pepper, freesia, Passion flower, marigold and cashmere food. I usually love floral scents but I haven't gelled with this one properly yet; it feels a little too flowery and sweet to the point that it's a little sickly. However the bottle is very pretty, with a small rectangular shape, shaded in purple with Lovestruck written in lime green surrounded by a heart and arrow. The lid of the bottle is what makes this perfume so visually pleasing, with several purple tulips topped off by a purple and lime green patterned bow covering the spritzer. 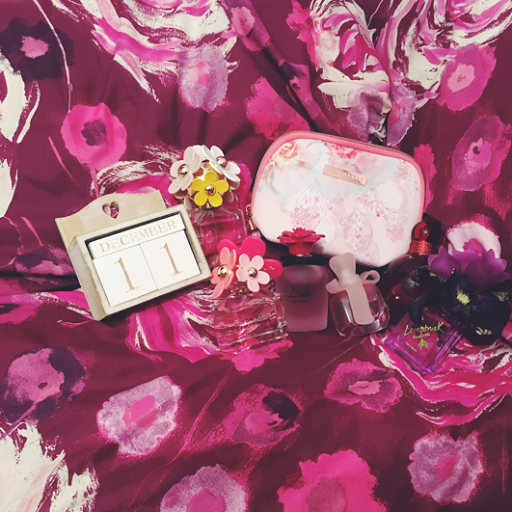 It looks nice paired with the Marc Jacobs Daisy range. The latest addition to my Perfume Collection is the Rosa Excelsa by Dolce and Gabbana, having smelt it in duty free at the airport in Poland, I knew that I had to have it... I love the smell instantly and Piotr loved it too, so it was one I knew I would love. However it's an expensive scent and so I decided that I should wait until I have the money. I actually found this scent on eBay for £29, so I snapped it up as the RRP is £55; quite a large difference in the price! I have the 50ml bottle. I don't regret buying this perfume whatsoever, it lasts for ages on my skin and I feel very feminine and pretty whenever I wear it. I adore floral scents and this one consists of papaya blossom, white amaryllis, water lily, daffodil, neroli leaves, Turkish rose and African dog rose. The bottle itself is beautiful too, heavy pink frosted glass makes up the rounded shape that holds the fragrance and the lid is a sculpted red rose with a black bow around the neck of the gold spritzer. Overall it's look is very high end and classy and goes well with the other perfumes shown in this part of my collection.